It is Tuesday 1 May and the largest cruise ship to date has just docked at Invergordon. My first glimpse is a smudgy column of smoke from its funnels eight miles away, looking out of the window from the 7:00 Inverness to Wick train shortly after leaving Dingwall. There are not many cruise ports within easy walking distance of a great scenic railway. 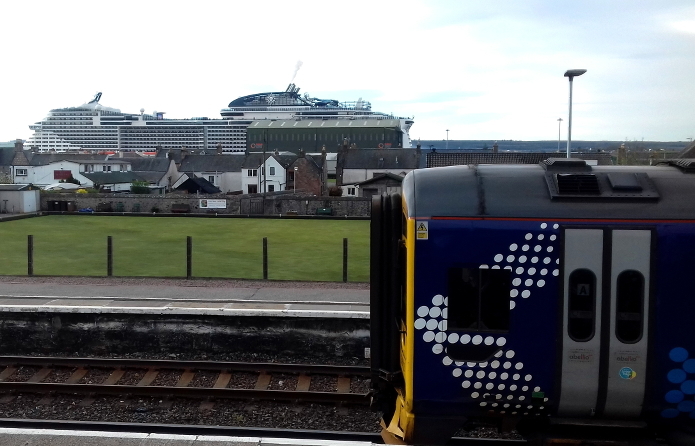 The purpose of my trip is to see what the arrival of a cruise ship of this size in the Highlands looks like, and what possibilities it might offer for the Far North Line. At closer range, MSC Miraviglia looks more like a high-rise building than a ship. No classic lines here, but I can't help feeling impressed by the size. At 316 metres long and 19 decks tall, this floating resort can accommodate over 5000 passengers. I am informed by a crew member that today's passenger complement is about 4400, of which about 3000 will go ashore. Roughly half of those going ashore will take a guided tour by coach, minibus, or taxi. That leaves us with some 1500 visitors invading the Highlands using their own initiative. Bathed in watery sunshine, Invergordon High Street has a festive holiday feel to it despite the cold breeze. People take selfies outside Farmfoods and crowd into double-decker buses laid on by Stagecoach to take them to Inverness. A return bus ticket costs £12.50. By comparison the train costs £14.40, is less frequent, and takes 20 minutes longer. However the train is more comfortable and offers really fine scenery on its way around the Beauly Firth. Just eight cruise passengers take the 9:42 train to Inverness. The next one at 11:31 attracts similarly low numbers. In addition, two cruise passengers are joining me on platform 2 for the 11:30 northbound train. They are an elderly but enterprising couple from Switzerland heading for Dunrobin Castle which is exactly where I am going. In total there are just 15 passengers on the two-coach train. This means there is plenty of space for a few more cruise passengers, at least this early in the season. Five people leave the train at Dunrobin Castle: two backpackers, the Swiss couple from the cruise ship, and your intrepid correspondent. The castle itself is a pleasant 400 metre walk from the station, and there is no denying that it makes a perfect destination for cruise passengers. Here is a fairy-tale castle in a fairy-tale setting with lots of history. The operation seems smooth and well geared-up for mass tourism. This is just as well because no fewer than eight coaches from MSC Miraviglia will call here today. Inside the castle every bit of brass, copper, and silver is polished like a mirror. Informal conversations with friendly staff suggest to me that the castle would very much welcome more of their visitors arriving by rail. The current rail timetable allows from 12:48 until 14:42 for a visit to Dunrobin. That is enough for an able-bodied person to walk to the castle and explore its interior and grounds. However it is a bit short if you also want to have lunch at the castle. The next train south is not until 18:08 which is too late to be of practical use. Afterwards, my Swiss travel companions tell me they have really enjoyed the train journey and the castle. Coming from people who have the Glacier Express, the Golden Pass, and the Bernina Express where they live, I think we should take this as encouragement. This year 12 cruise ships visit Invergordon during May, increasing to 24 during the month of August. 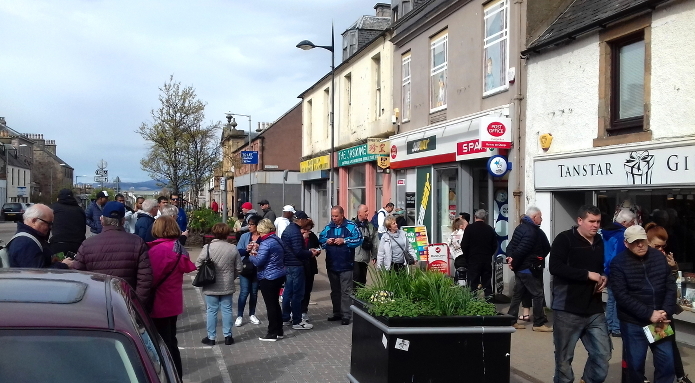 A cruise ship is typically ready for disembarkation at Invergordon at 8:00, and most passengers will want to be back at their ship by about 16:00 - 18:00. 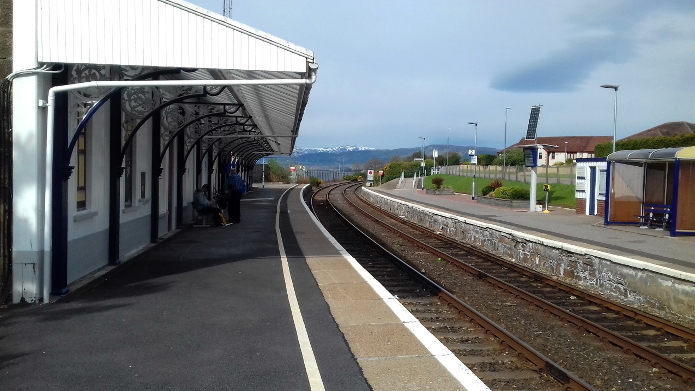 The current rail timetable allows a trip south to Inverness, north to Dunrobin Castle, or possibly to Helmsdale, with an hour and twenty minutes there. The cost of a self-organised train trip compares favourably. A return train ticket from Invergordon to Dunrobin Castle costs £22.80 while entry to the castle costs £11.50. 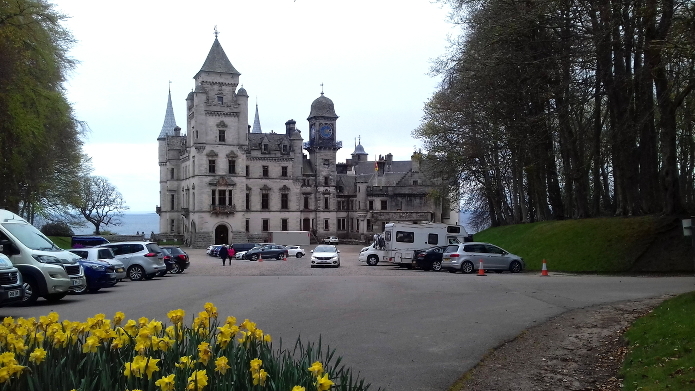 A guided coach tour to Dornoch and Dunrobin Castle is advertised at £56 on the MSC Cruises website. The obvious way to get more cruise passengers onto the Far North Line is to advertise it through the information stand at the foot passenger exit of the port. There may also be possibilities on-line. Ironically, with this many potential customers we are at risk of seriously overcrowding the trains instead of just filling spare seats if the idea catches on. On the other hand there may be scope for longer trains, especially when DMUs become available with the introduction of the new modified HST sets. Ultimately there is the idea of a dedicated tourist train, with panoramic coaches and cream teas and such things, marketed through the cruise companies and bookable on-line. Whether enough people could be persuaded to choose it in favour of a bus trip to Culloden Battlefield and Loch Ness is a different matter. For me the choice would be easy.